Hi Serif guys, what a great and powerful iPad app you've create, absolutely love it! I hope the picture could make my thoughts clear. When you do retouching work on iPad, Clone Tool/Healing Brush is a must tool, and you need to constantly change sampling points around the target area to avoid repeating patterns. Use the finger hold and wait few seconds, choosing sampling point, then raise your finger and put the Apple Pencil down back to the screen to retouch the target area is LOW-efficient and Inaccurate. Also, while using brush tool to paint local color, we need constantly sample certain color near the Pencil tip on canvas, that means Eyedropper-Brush Tool quick switching in a flash. In desktop environments, like Photoshop, the function key Option (Mac) / ALT (Windows) on the keyboard does the job perfectly -- press the function key, use wacom's pen tip to sample in tiny area on screen. We have Apple Pencil and iPad Pro now, but we don't have that Cintiq (or Intuos) experience yet. I just couldn't find an efficient method on iPad version Affinity Photo to switch between relative tools. So, can you consider adding a shortcut key on the screen? 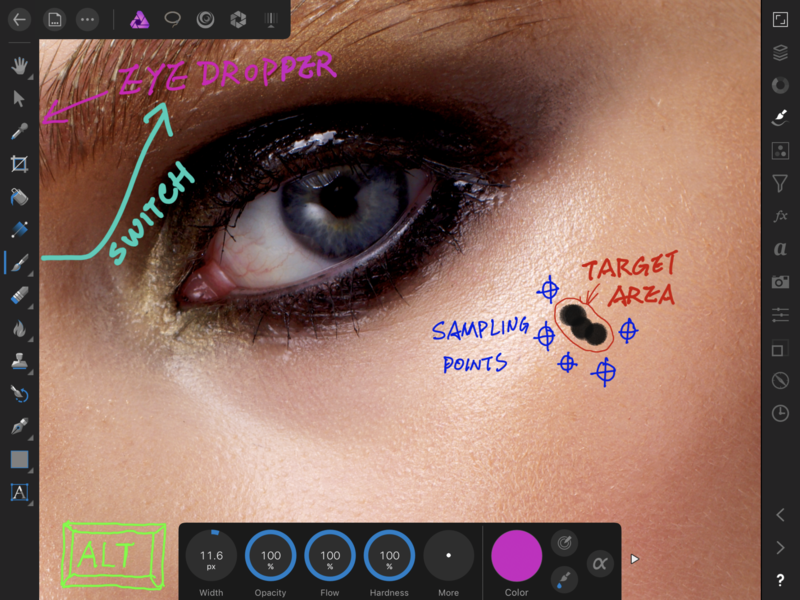 Make it a functional on-the-go retouching and painting tablet. This feature could also be added with a multitouch option. Holding down three finger fingers could work like a ALT feature. That would make it even faster, then you could do that anywhere on the screen and have no need to find the ALT virtual button. Thought it would be nice to have this configurable. No, please no three finger actions! When you paint with your right hand you can't really fully control how many fingers touch the surface for sure. Finger taps are the most insanely inaccurate and non-intuitive gestures. Holding the ALT button with left thumb to change the brush to the eyedropper would be ideal flow. Press and hold can only be made with another hand, not pencil since it takes pencil press as a pressure. If finger rejection os on, it wouldn't work either. BTW. Astropad does have the ALT button. Completely agree. Although after a week of use I love Affinity Pro, not having the an option key or gesture really slows down my workflow when retouching. It should also work to temporarily invert the selection mode (add or subtract) when in the Selection persona. On screen modifiers are now here. I've no idea when they were added, but I've only just discovered them. There is a new video in the tutorials section that introduces them.